Today I want to tell you about one of my three photo tours to Salzburg. My girlfriend and I made this tour in April to visit a thesis defense at the university in the late afternoon. After arriving at Salzburg around ten o’clock we started our tour with sightseeing and photography. For this trip I had the opportunity to use the, at this time brand new, Olympus OM-D E-M5 Mark II with the Zuiko 12-40 F2.8 Pro lens. I carried the gear in my good old Sony Alpha shoulder bag. The weather was a bit cloudy. Our first stop was the Mirabellgarten not far from the train station (Tip: Buy a day ticket for the Salzburg buses, it’s very cheap with € 3.60). 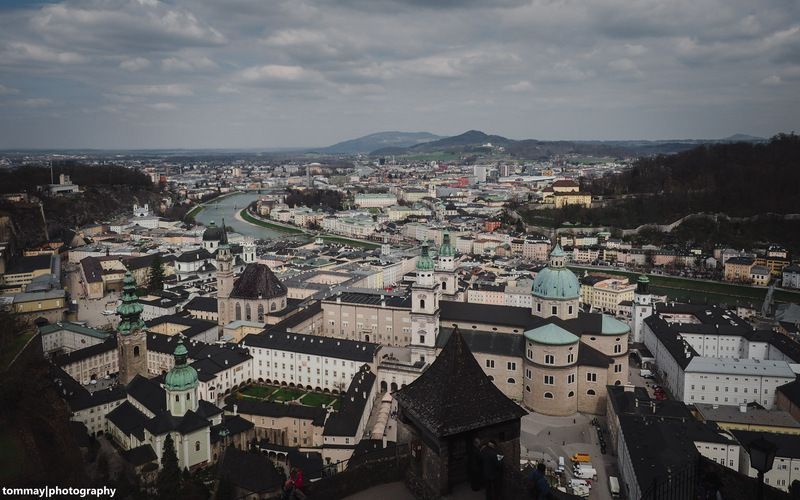 Then we went south via Markatsteg (with countless padlocks – very cool view) to the Residenzplatz with the Salzburger Dom nearby. The next destination was the Mönchsberg where you can see the stunning Salzburger landscape and the Fortress Hohensalzburg. The Fortress itself and the view over the city are truly beautiful and impressing. Finally we went back down to the river Salzach and enjoyed the scenery while sitting on a bench. Enjoy the pictures – constructive critique about the editing is always welcomed. As mentioned before this was one of my three visits in Salzburg in 2013, 2014 and 2015. I will cover the other two visits in separate blogposts as I always used different camera equipment. The locations we visited at this day were really enjoyable, especially the Mirabellgarten and the Mönchsberg. I can only recommend visiting Salzburg for some days or for several one-day-trips. It is a beautiful city with many interesting sights. The Olympus OM-D E-M5 Mark II and the Zuiko 12-40 F2.8 Pro are great for a city trip as it is very light and small combination, easy to carry and use. The quality is also outstanding. The camera is quick and responsive. The usability is very intuitive especially with the touchscreen. The menu system is a bit confusing but you get used to it. For bigger hands I recommend using the extra available extension grip for more secure handling. I shot only JPG and the Olympus delivered very good images out of the cam. The dynamic range is also good for a camera with MFT sensor. I only edited them slightly in Lightroom 6. My only critique is the resolution of the sensor. Some say 16 MP are enough, but nowadays in my opinion 20 mp should be the minimum at cameras that features bigger than 1″ sensors. Also the impressive 5-axis-images stabilization works amazing! Every camera should have such a system. The Zuiko 12-40 F2.8 Pro offers great image quality. Very nice colors, very good sharpness at all apertures from edge to edge, only some flares when shooting directly towards the sun and no C/A makes it a very good all-round lens for the OM-D system. Also the clutch system for AF/MF switching is very intuitive. The focus ring offers a very smooth focusing and makes MF combined with the magnification and peaking of the E-M5 Mark II very easy. AF is also very quick and reliable. It was a really good day with many photos and then a very interesting thesis defense at the university as a worthy ending (although I didn’t understand anything *g*). Previous post: Tamron SP 35 F1.8 VC USD – Super Performance prime lens – Part II!